The glossy desk-top publication World War II edited in Leesburg, Virginia, chose to highlight for its July-August 2007 cover an article by a Newsweek bureau chief, Andrew Nagorski. Titled “Moscow, 1941" with a tag line reading “The Deadliest Victory," the Nagorski piece referenced “the largest and most costly battle in all of human history." This was the dramatic Russian counterattack against the hitherto invincible Nazi forces outside Moscow in the late winter of 1941. “Seven million men fought, twice the number engaged at Stalingrad, which in the popular imagination holds a far greater claim as the bloodiest clash of World War II." Nagorski claims two and a half million combatants killed, severely wounded, taken prisoner. These impressive statistics are almost glossed over by London University’s Geoffrey Hosking in Russia and the Russians: A History. Hosking disposes of the Battle of Moscow in two brief sentences: “On 5 December Zhukov launched a counteroffensive which drove the Germans back about eighty miles…The battle before Moscow was the first occasion on which the German Blitzkrieg strategy had suffered a serious reverse." It seems that pop journalism has bested academe, at least in July-August 2007. An eighty mile retreat for Hitler’s surging Wehrmacht; two and a half million lives lost – these are colossal data, dwarfing any engagement undertaken by any of the Western Allies in World War II. Yet, for the Russians, victory outside Moscow was but a necessary respite in the fight for national survival. Much much suffering, including Stalingrad, lay ahead. This essay analyzes a popular culture belief that America won World War II virtually unaided, intervening to save those “snotty-nosed Englishmen" or shore up the stumbling Russians with Lend Lease. This cultural assumption has been handed down through the generations more or less intact. It is an assumed reality among those who have had to engage formal or informal popular audiences in the United States. Of cours,e Lend Lease mattered. Hoskins offers good evidence from Stalin himself that Russia would have been in a fix without Lend Lease “because we had lost so much of our industry." The bigger point for this essay, and a necessity for understanding the world today in the light of World War II, is the very real blind spot caused by ignoring the Russian contribution to victory in 1945. Nagorksi was not alone in his reminder. Popular journalist David Halberstam, in a posthumous essay published in Vanity Fair (August 2007), lamented the present Washington government’s naiveté – if not scorn – towards history. He particularly excoriated his countrymen’s propensity to lose interest quickly in any battle in any war in which American forces were not engaged, with particular reference to the Russian Front (“the one least known…the most important"). This predilection could, for purposes of risky over-simplification, be called the John Wayne Myth of America’s participation in World War II. The double-edged relevance is that 2007 is also the centenary of the birth of Marion Morrison of Winterset, Iowa (a.k.a. film legend John Wayne). John Wayne’s legacy (1907-1979) was featured in a Barry Kibrick Between the Lines program aired over KLCS-TV Los Angeles on July 22, 2007, in the form of an interview with Wayne’s daughter-in-law Gretchen, a leader in the move to restore and reissue John Wayne’s films.The past was but a prologue to Kibrick’s offering that the Duke “would have been so proud of the young men and women in service in Iraq today." Television talk shows are often reliable antennae of popular moods. Kibrick is noted for being an enthusiast but most surely not a Western war hawk. His commentary tantalizes with the assertion that there is a generation now extant “that does reflect the patriotism, the caring" which John Wayne films apparently exemplified. Okay (as Norman Mailer might say). Maybe. There is evidence for that. There is an important cultural nexus, however, that connects the three personalities mentioned in this essay’s title. Present popular opinion on Operation Enduring Freedom, the U.S.-led invasion and occupation of Iraq, seems weighted to the belief that against the advice of wiser heads, Washington planners snapped out of action in Afghanistan prematurely and moved on Iraq in the quick-draw, fast-shooting traditions of…well, of the Ringo Kid (Wayne’s character in the 1939 Western film Stagecoach) or what Garry Wills calls “the dark acceptance of responsibility" of Wayne’s Sergeant Stryker character in The Sands of Iwo Jima. The Iraq invasion seems at this date at least to have been devoid of the carefully calibrated reservations and sober second thoughts of Generals Marshall, Bradley, Eisenhower, and Montgomery – the chief operations planners of World War II. The throbbing drums along the Potomac in the spring of 2003 seemed to echo more the spirit of the Gunslinger or of brave Gary Cooper facing down the Miller gang in High Noon or Chuck Connors as “the Rifleman," or John Wayne in a host of heroic roles from the 1970 Western Chisum (cited approvingly at a Richard Nixon press conference) to those already referenced. Yet – to backtrack briefly – an editorial in an otherwise obscure popular tabloid, The Mountain View News of Montrose, California, commented in its June 22 edition in the late 1990s on a point similar to the point of this essay. It was this: If Americans of the past three generations possessed Halberstam’s deep-seated awareness of how much the Russian people suffered in defeating the Nazis – (June 22, 1941 being the date of Hitler’s invasion of the USSR) – the whole course of the Cold War might conceivably have gone differently. The last thing, one could argue, the Russian people wanted in 1945 was another disastrous war. This tilt toward revisionism, if it is that, stems from that fact that The Great Patriotic War’s death toll on the USSR was at least 25,000,000 people – close to the present population of Iraq. One war leader who saw the crucial significance of June 22, 1941, to the Allied cause was Winston Churchill. His quote in the acclaimed ABC television series, The Valiant Years (1960-1963) that it was “the Red army that tore the guts out of the Nazi beast," is substantiated by similar statements in his war memoirs. For Churchill, Western Allied operations even after D-Day were “on a smaller scale" compared with the “magnificent" Russian efforts. Once again, popular journalistic history, even allowing its bias for sweeping judgments and hyperbole, can at times remind us of the obvious. World War II magazine’s glossy cover displaying white-clad Soviet troops and T-34 tanks advancing on German positions bears the impressive sub-title “A million men died but they stopped the Nazi war machine." This was not too much of an exaggeration. Not at all. If all the above is important in setting some subliminal cultural context for an Iraq War many observers now lament as hastily misconceived, what evidence is there that “the John Wayne syndrome" affected America’s virtual “round ‘em up/move ‘em out" policy in Iraq or the even larger conception of the war on terror almost in movie land terms as Us versus Them? American popular myths are popular precisely because they sometimes offer social cohesion to that diverse assembly of voters gathered in coffee shops, bars, small–town cafes and juke-box joints to rehearse their communal stories through a lens that is easy to grasp but seductively misleading. This seems a permanent and important feature in a nation so huge, so diverse, and so opinionated. Whenever World War II is discussed in such grassroots locales, there inevitably looms large the hefty image of John Wayne as fighting Seabee or as indefatigable Sergeant Stryker (a movie played to recruits at some Marine bases) or as paratroop leader Lt. Col. Benjamin Vandervoort in The Longest Day, the Allied assault on Europe on June 6, 1944. “People like to watch the old tales in a time of social chaos," offers Garry Wills in his provocative 1997 study, John Wayne’s America: The Politics of Celebrity. Has the John Wayne myth played a more direct role than is imagined, a myth its fabricators may not have been intending as a socio-cultural agenda? The serious historical literature on the mistakes that led to the Iraq stalemate is growing. Thoughtful analysts are haunted: Whence this haste, this “hell bent for leather" determination to transfer from one dangerous, unsecured front in Afghanistan and reengage thousands of miles away? The fact that the British public was consistently skeptical about Operation Enduring Freedom and that the Canadians fought in Afghanistan but opted out of Iraq (two of America’s very closest Allies of WWII) caused Fulbright Scholar Bruce Solheim to lament the un-wisdom of neglecting the opinions of traditional Allies, especially after Vietnam. A decade-long series of starry pronouncements in the 1990s from ranking Americans who should have known better touted the United States as “the indispensable nation" or the “nation that sees farther and longer than others" – a reflection of a tendency towards overweening unilateralism that some might see as hubris. Once again it was David Halberstam, critiquing the left this time, who opined to Charlie Rose in a post 9/11 interview that the 1990s could be titled “Why America Dozed" with apologies to John F. Kennedy’s analysis of British decay in the 1930s titled "Why England Slept." Even more to the point is hawkish columnist Charles Krauthammer’s Weekly Standard cover story of June 4, 2001, titled “The Bush Doctrine," three months before 9/11. The pundit made no bones that “overwhelming American power is good not just for the United States but for the world." All this revived exceptionalism had to have played some part in setting up what now looks like not only a benign overconfidence but, given the dating of the Krauthammer piece, a reflection in real world terms of a Rooster Cogburn style of American foreign policy. In the climax of this truly entertaining 1969 movie – the film for which John Wayne finally won his Oscar – the aging sheriff unilaterally charges three outlaws with the reins of his horse between his teeth, both hands firing firearms with deadly effect while a more law-abiding Texas Ranger (Glen Campbell) looks on. Of course, in the crunch, the cowboy goes it alone. 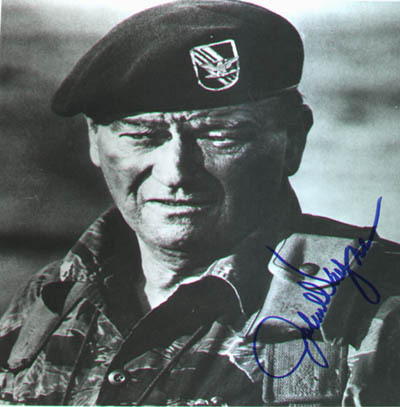 The deeper and embedded cultural point here is that for large sections of the American public, the almost mystical faith in the Eagle Rampant conveyed by such images as John Wayne as Lt. Col. Vandervoort admonishing his paratroopers on the eve of D-Day with the guttural “send ‘em to hell" – well, this cultural iconography may well reflect the way many Americans see the world. It is appealing, it is simplistic, and it is misleading. In such a world, it is easy for overeager policy-makers to forget one of the clear lessons of World War II: we needed the Russians, the Brits, and the Canadians. It was the Canadians who gained the most ground on D-Day, incidentally. The British had been fighting Hitler longer than anyone, since September 3, 1939 – a good two plus years before Pearl Harbor. We needed them all but, oh, how we needed the Red Army. Just reciting such facts as Nagorksi’s report on the number of troops engaged in the Battle for Moscow in late 1941 might have made a cautionary parable. In that light, to disengage U.S. forces from Afghanistan and suit up for Iraq recalls Abraham Lincoln’s “One war at a time, Mr. Secretary" rebuff to Secretary of State Seward, then fuming at some British high-handedness. “Well, it’s up to us to lead the posse again all on our own" is a tempting mindset for too many Americans, and hence voters, to fall into. Again, realizing the difficulty of empirically gauging popular moods and the influence of opinion on foreign policy, the obvious is hard to ignore. What is startling is the 1995 Harris Poll cited by Garry Wills which shows John Wayne voted America’s Number One box office star, ahead of both Clint Eastwood and Mel Gibson. John Wayne died in 1979. We are thus clearly in the presence of a cultural phenomenon. In The Sands of Iwo Jima, a World War II classic, Wayne’s rallying cry to his marine recruits is “Saddle up!" Garry Wills summarizes the John Wayne image as speaking to the needs of Americans at a crucial time, the intensely scary immediate Cold War period of 1945 to 1965. According to Wills, Wayne fit Douglas MacArthur’s idea of the model soldier, the VFW gave him a gold medal and the Marines their “Iron Mike" award – impressive for a man who never served. Wills reworks ideas already explored by Richard Slotkin’s 1992 effort, Gunfighter Nation: The Myth of the Frontier in Twentieth Century America, but his analysis is not without a certain regard and respect for what the John Wayne image meant and means to a significant number of Americans. This is an important point of balance. Irish-born co-star Maureen O’Hara told a Congressional panel that for millions of people around the world “John Wayne is America." In Wills's retelling, Wayne is reinterpreted as “the most recent embodiment of the American Adam" – "free to roam, breathing a freer air than the cramped men behind desks, the pygmy clerks and technicians." Wills said best what has often been intimated: “He is the avatar of the hero in that genre that best combines all these mythic ideas about American exceptionalism – contact with nature, distrust of government, dignity achieved by performance, skepticism toward the claims of experts." Yet both Halberstam and Wills might offer that there are far too many somber echoes of such Western scenes as Alan Ladd’s Shane riding off to town on his own to settle scores with his gun in the Iraq misadventure. “Ain’t nobody gonna tell me nothin’ nohow" is still a recognizable trait of thinly disguised cowboys who have invaded other genres, from Hans Solo of Star Wars to Governor Arnold Schwarzenegger as the Terminator. In his last essay, Halberstam thus pointed out the cultural resonances of President George W. Bush’s slipping into cowboy lingo as the war on terror began – using such expressions as “wanted dead or alive." From the late 1940s on, argues Wills, John Wayne incarnated the myth of the cowboy so successfully as to become a symbol of America for millions. Wills's skill at fitting this myth into America’s mainstream culture is well worth rereading amid our current political angst. It is time now to return to the opening exposition and dust off journalist Alexander Werth’s almost forgotten study of Russian resilience in World War II. It was issued in 1964 and titled simply, Russia at War: 1941-1945. Werth’s study functions as vital background to both Halberstam and Nagorski’s timely offerings. His massive and personalized study drew attention at the time for not only reminding Western readers of the Soviet military contribution but also for advancing the notion that Russian industry was catching up quickly after the terrible mauling of June-December, 1941. As the war rolled on, for example, Russian artillery was clearly the deadliest (“Stalin’s organ-pipes" the German soldiers called it) and the T-34 tank a superb weapon. 1) The Russians fighting the Germans along a 2400 mile front whereas the El Alamein front in North Africa, for example, was forty miles at best. 2) While 400,000 British and 300, 000 Americans perished in World War II, the Russians suffered more losses in the siege of Leningrad alone. 3) A full 93% of casualties inflicted on the Nazis were imposed by the Red Army from 1941 to 1944. D-Day was vitally important (Werth quotes Stalin: “[N]o undertaking comparable to it.") not the least because a botched Allied invasion might have prolonged the war another year. It was the Russian front, however, that appears most decisive. 4) Werth personally witnessed the aftermath of the greatest tank battle in history, the Russian response to Hitler’s Operation Citadel at Kursk in August 1943. It was estimated that some 6000 tanks and 4000 planes were involved. German losses were put at 70,000 killed but the real impact was psychological. “The legend that in summer the Germans always advanced had been dispelled once and for all," reported Werth, also endorsing the “extraordinary sureness of touch the Russians had shown in this battle." 5) During Operation Bagration – June-July 1944 – the Red Army advanced 500 miles in five weeks and badly mauled thirty German divisions. Werth quotes the German official history: “a greater catastrophe than Stalingrad." This was overshadowed in the Western press, and understandably so, by the invasion of Normandy. Yet, the German loss of 350,000 men in almost thirty divisions, recalls the number of Nazi divisions General Mark Clark faced in Italy. By any measurement, these are impressive statistics. The blithe assumption that World War II was largely an American show needs revising, with important implications for the ways in which we could relate to Russia today and in the future. Even the Eagle Rampant needed allies and plenty of them. That is a vital lesson of World War II. It neither denigrates the Allied sacrifices in blood and treasure nor the evidence for John Wayne being a paradigmatic American figure in our time, to argue for a more realistic popular assessment of the way history really happened. The fact remains that the Soviet Union recovered surprisingly quickly from the sledgehammer blows of the Nazi advance. That included the retooling of the war machine. Brutal dictators can move quickly and it was a feat little appreciated in the West that Stalin had moved most of his heavy industry behind the Urals to eventually produced aircraft, tanks, and especially artillery that could match anything either the Allies or the Germans had. We must give the devil his due. “Everyone is always underestimating the Russians," Churchill is said to have muttered. In this year of John Wayne’s centenary is it useful on more than two levels to have Wills and Werth’s readable correctives to the sweeping assumptions David Halberstam assailed in the years left to him.